At first look, Double Joker Poker by BetSoft may surprise you: it looks exactly like the Double Deuce Poker by the same company. The graphics and the interface are exactly the same, the only difference is in the rules: Double Joker Poker is a classic video poker game. In other words, the rules and hand variations of classic poker games are being used, and there are two joker cards in the deck. These jokers can be used to replace any cards you wish to complete a winning hand. The highest hand you can get is a Royal Flush, it pays 4.000 coins if you are playing with the maximum bet levels. 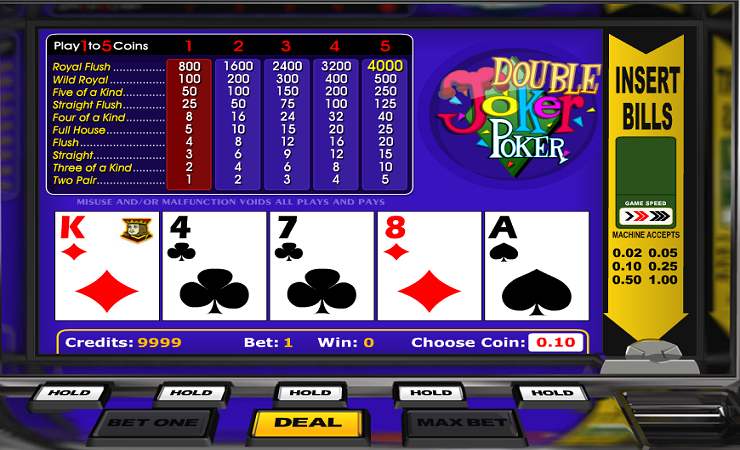 Like almost any other video poker game, Double Joker Poker payouts depend on the bet levels. As you can see, the paytable located at the top has five rows. Each row represents a different bet value and pays accordingly. You can set the coin value between 0.02 and 1.00. And each round, you can choose to bet 1.00 or 5.00 coins. Betting maximum will allow you to win the highest payouts. For example, the Royal Flush hand pays only 800 coins if you bet 1.00 coins per round. But if you play with 5.00 coins, it pays 4.000 coins as we mentioned above. In other words, playing with highest bet levels is advised if you want the maximum payout. You can start the game simply by clicking on the “deal” button. The game will deal five cards. You can hold the ones you like by pressing on the same named buttons located under the cards. (Or, you can choose to hold none of them and discard the entire hand.) After that, click on the “deal” button once more. New cards will get dealt in exchange for the ones you didn’t hold. If the final result is a legit poker hand, you will get paid according to the paytable and your bet levels. Double Joker Poker gives you 1.000 complimentary coins to use in the demo mode. Since you need 5.00 coins for the maximum bet, 1.00 coins are more than enough for hours of free gameplay. This is a classic and old-school video poker game, and suited mostly for beginners. You can also use the game for practice, but when it comes to real-money gameplay, it is better to find another option – the payouts are really low in Double Joker Poker.